Because of its rarity, the Pediatric/Wildtype population have fewer resources available to them, with a smaller pool of physicians and medical institutions that specialize in their treatment. As the body of knowledge surrounding Adult GIST grew, and information about this subset came to light, it became clear that life-saving treatments and research needed to be made available for this “rare” population. The seeds of what would become the Pediatric and Wild Type Clinic began through efforts to create a way to serve Pediatric GIST patients and their families. The Life Raft Group, a Patient Advocacy organization for GIST patients, early on served as a source of support for this population by hosting the first Pediatric GIST Conference in 2004 in Montreal. Recognizing the need for more access to treatment, research studies and support, a viable way to bring this to light had not yet materialized. 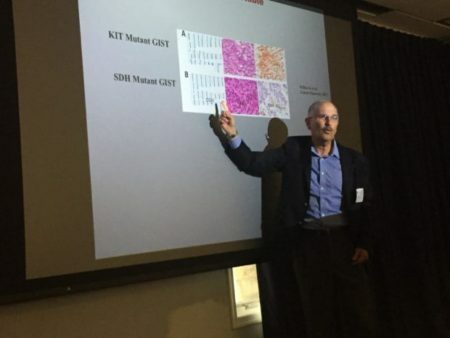 In 2007, at a Connective Tissue Oncology Society (CTOS) conference, Norman Scherzer, the Executive Director of the Life Raft Group, began a dialogue with Dr. Lee Helman of the National Cancer Institute and Dr. Alberto Pappo, Pediatric Oncologist at St. Jude’s, who were presenting at a Pediatric Oncology session. They discussed the potential for gathering an international panel of physicians with an interest in pediatric GIST and a complementary set of skills. The idea was to create a center of excellence where medical professionals and researchers could begin to learn about these rarest of patients. While GIST is rare, the Pediatric (also known as Wildtype or SDH Deficient GIST) is even rarer, comprising only 5% of all GIST cases. Present at that clinic was a team of clinicians and researchers from across the United States, and members of two patient advocacy groups, The Life Raft Group and GIST Support International. The first group consisted of 14 patients and their families. As of June 2018, there have been 16 clinics held with 171 of these rare patients seen. Groundbreaking research has resulted, and patients and their families have had the opportunity to both consult with experts in the field and to meet with one another so that they do not feel so alone.